The European Convention for the Protection of Human Rights and Fundamental Freedoms (ECHR), signed in Rome on November 4, 1950, and entered into force on September 3, 1953, was ratified by Italy in 1955. Only years later, in 1973, Italy accepted through an ad hoc declaration the competence of the existing supervisory bodies—then the European Commission of Human Rights, an inquiry body that supported the Court, and the Court as a deciding organ—to receive individual applications filed against Italy by any person, nongovernmental organization, or group of individuals claiming to be victims of a violation of the rights and freedoms recognized by the Convention. 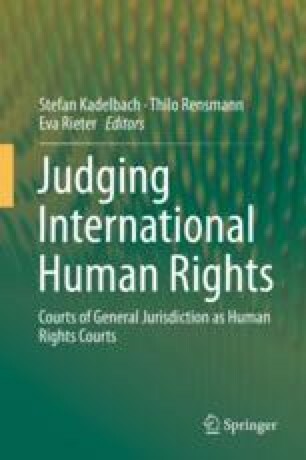 This chapter discusses certain important judgments of the European Court of Human Rights (ECtHR) that have condemned Italy. It then focuses on the responses given by the Italian legislator and judiciary, respectively, to this case law, with a focus on the judgments of the Constitutional Court.